コメント: Dispatched, from the UK, within 48 hours of ordering. This book is in good condition but will show signs of previous ownership. Please expect some creasing to the spine and/or minor damage to the cover. Damaged cover. The cover of is slightly damaged for instance a torn or bent corner. An unforgettable and moving story for older readers from mega-bestseller Jacqueline Wilson, featuring a special introduction from the author. April knows she was abandoned in a rubbish bin as a newborn baby, fourteen years ago. Now she's happily settled with her foster mother, Marion -- but there's a part of April that's desperate to know where she really came from, and who she really is. If only she could remember her real mother -- or even find her. 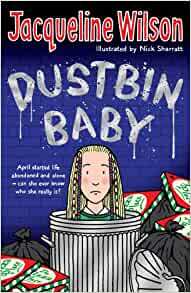 An engrossing, engaging and highly moving novel from the acclaimed bestseller Jacqueline Wilson.